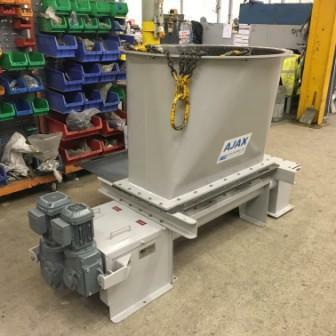 Ajax Equipment, Bolton, UK, has supplied a leading process solutions provider based in the north-west of England with a hopper and twin screw feeder for powder handling. This company, which has not been identified, supplies equipment and processing systems for the safe handling of powder and granular materials as well as liquids and gases. The hopper and twin screw feeder form a discharge system to deliver anhydrous sodium sulphate from a 40t capacity silo. To efficiently deliver anhydrous sodium sulphate the feeder features a larger screw supplying a bulk fill line and a smaller screw for batch supply. The hopper’s flow-friendly shape ensures that the zone in which the twin screw feeder operates remains filled, while the feeder’s screws and variable pitch flights control the powder flow onwards.